What are good edible plants for my landscape and garden? Edible plants offer the same benefits in an outdoor learning environment (OLE) as traditional landscape plants—creating shade, defining paths, providing hideaways, beautifying the space, but they also add value by having edible parts. Edible plants provide many diverse learning experiences, including broadening the range of fresh, nutritious foods for children to enjoy. Research shows that children are more likely to try a new fruit or vegetable if they have been involved in planting, growing, and harvesting it. Edible landscapes at childcare centers where young children are enrolled year-round in all-day programs offer potential for children to learn healthy eating habits that will stay with them through life. Edible landscaping in childcare centers shares many similarities to domestic edible landscapes and can be implemented in two forms: permanent or perennial and annual edibles. Permanent edibles include trees, shrubs, vines, and herbs that produce every year. Integrated into the overall planting plan, they can share space with appropriate settings throughout the OLE. Bear in mind that most fruit trees and shrubs require full sun and some have specific cultivation conditions, including soil quality and/or irrigation. Alternatively, consider planting fruit trees and shrubs in “orchard” groves or some other way such as on a pergola or arbor or espaliered on a south-facing wall, in locations that draw attention and create memorable settings. In spring, orchards become magical places as pollinators work busily overhead and petals fall like snow. In summer, shady orchards create cool gathering places or nooks for reading. 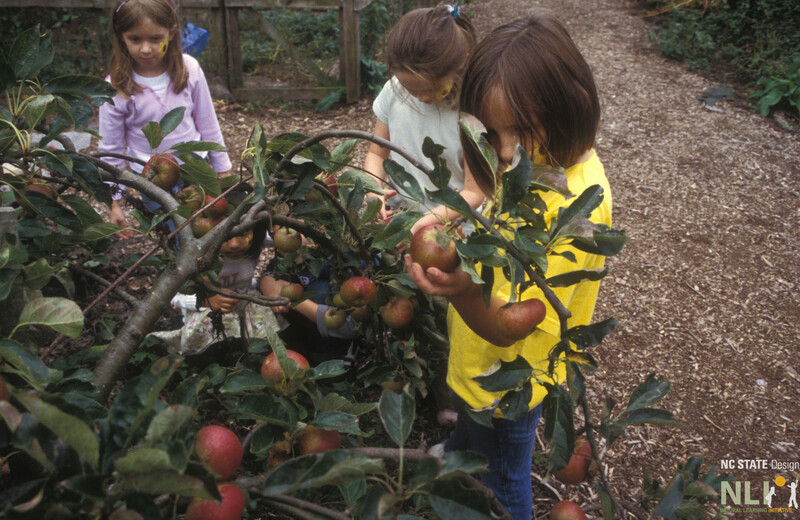 In autumn, a plentiful harvest provides curricular and nutritional opportunities. Orchards gain in value each year as trees send roots deeper into the earth and become a perennial place of health and enjoyment for generations to come. Annual edibles are vegetables that must be replanted every growing season. Because annual vegetables grow so fast and so dynamically, they provide diverse, hands-on learning experiences that change with the seasons. Thoughtfully planning annual crops with seasonal cycles in mind can provide opportunities for children to care for and engage with the environment nearly year-round. As they are enjoying the current harvest of tomatoes and green beans, they can be starting to grow lettuce and cabbage for the Fall and Winter.